Casablanca is the economic capital of Morocco, not its cultural capital. It has wide boulevards, huge construction projects along the coast, and a cosmopolitan attitude. If you want ambiance, go to Marakesh or Fez. Nevertheless, it has the biggest airport in the country, so if you’re arriving to Morocco by plane, chances are you’ll be passing through. You can hit up the main sites in a lazy day, I recommend taking taxis–the petit ones are cheap and everywhere. La Sqala is a great place to eat on a nice day–it occupies a fortress-surrounded courtyard at the edge of the Old Medina. 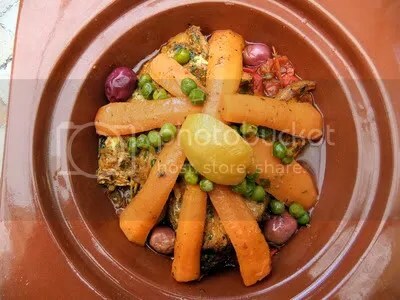 Pictured is the fish tagine. Their mint tea is (like every other place you’ll ever have it in Morocco) excellent. 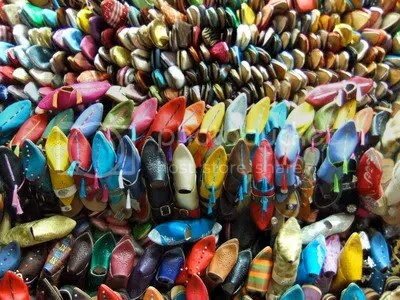 Casablanca has two medinas–old towns-turned-marketplaces. The Old Medina looked like the place to go for knock-off purses and crap–maybe there was nicer stuff to be discovered there, but I was in and out in 5 minutes– put off by how dirty and dark it was–and the violent fight between 2 young men that spilled out of a store. I high-tailed it to the Quartier des Habous, which was chock full of real Moroccan stuff–tea and olives, leather work and pointy shoes, lanterns and wrought iron, robes and custom suit-tailors. The streets were clean and wide. It was peaceful there. As I decided amongst the slippers, I was offered a shot-glass of mint tea. Again, excellent.